« Is the UCI Trying to Ruin the Tour de France? 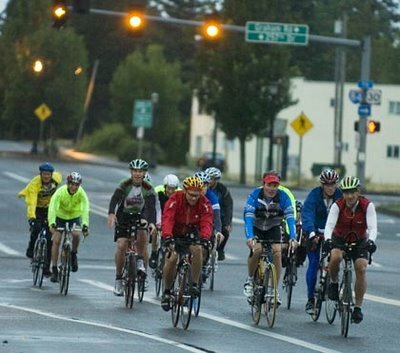 The Race Across Oregon started this morning in Portland. It is a brutal 535 mile Race Across America qualifier. It’s more a loop around Oregon than it is just across Oregon. After Chris Grealish did it in 2004, he said it should be called the Race up Every Climb in Oregon. It climbs over 40,000 feet in those 535 miles. I also raced it in 2004 and quite honestly it felt like more than 40,000 feet. A month before the race, I had ridden the course in 4 days and even then it felt like more than 40,000 feet of climbing. Not only does it have that much climbing but it finishes with a brutal climb to Timberline Lodge. Tom Letsinger from GVH Bikes is racing this year. He crewed for me in RAAM last year. Tom finished 3rd in the Ring of Fire last year with 342.2 miles in 24 hours. I believe that’s the longest he’s ridden before. Right now he’s toward the back of the pack but it’s still early in the race. In any case, just finishing the Race Across Oregon is a very tough task. In 2004 I motioned my follow vehicle beside me around mile 340. I stopped and leaned against the vehicle and told my crew I couldn’t continue. I then sat down and cried from the emotion of dropping out and the pain I was in. I had some GI issues brought on by too much caffeine and sugar in an attempt to stay awake after some nasal spray made me sleepy. Several trips to the bushes had made it unbearable to sit on my saddle. After my crew let me cry beside the road for a few minutes, they coaxed me the 60 miles to Prineville which is the only town of any size on the course. There they were able to get some medicine that helped but I was still in pain. I did make it to the finish and qualified for RAAM for the 3rd consecutive year. I have now qualified 4 times and the Race Across Oregon was by far the toughest qualifier for me. I hadn’t realized that Tom had gotten into the ultra events. Looks like he did pretty well at the Ring of Fire! Unfortunately, it looks like he had to DNF before reaching the 5th time station at RAO, but I’m sure he put in a good ride and gave it all he had. Congrats to Tom, and all the riders, for even having the guts to try such a difficult race! Subscribe to newsletter to get weekly blog summary, deal notifications and chance at winning t-shirts and other weekly prizes. Copyright © 2006-2014 Rob Lucas. All rights reserved.